Football - Brighouse Town v Harrogate Railway. Ernest Boafo for Brighouse. Brighouse Town suffered a heavy 4-1 home defeat at the hands of Evo-Stik Northern Premier League Division One form side Harrogate Railway. Prolific striker Tom Matthews put the hosts ahead a minute before the break when he curled a superb shot into the net from the edge of the box. However, Railway steamed back after the break to claim the spoils in emphatic fashion. The visitors were back on terms after 63 minutes when Adam Baker netted, and they nosed ahead eight minutes later through Matt Heath. 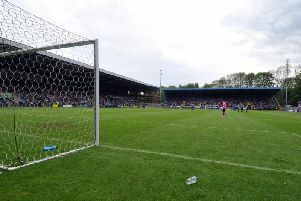 Halifax-based Nathan Cartman put daylight between the teams when he scored from the penalty spot before Jesus Martin-Farina put the icing on the cake with Railway’s fourth deep into stoppage time.